Heading on a cruise had never been a huge interest of mine. I had absolutely no idea what to expect when walking my bag to the Vancouver cruise ship port, but since I stepped foot on board I knew once again… My expectations of this experience were already entirely wrong. 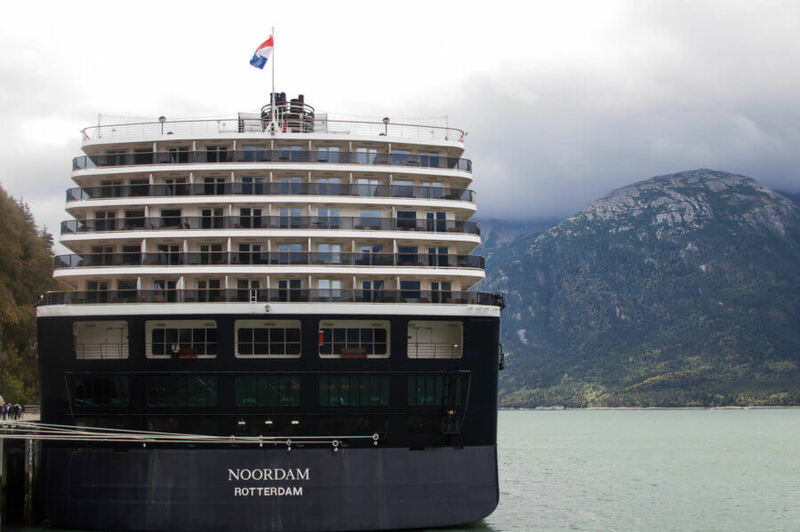 I left Vancouver for a one week Northbound Glacier Discovery cruise onboard Holland America Line’s, Ms. Noordam. A huge 3000 person ship with everything imaginable on board. I had no idea what to expect, but to me, that made it all the more exciting! The first day of a cruise, as to my expectations, was nothing but security, customs and boarding. But much to my surprise, the process was very very quick. Not the 10-minute security lines that you often experience in airports… but it was not hours long like I had imagined. I really did think the line would be huuuuuuge and of course, very slow moving. There’s no doubt that it was big, but the rate at which we were being processed was very quick. There were around 30 staff members checking the passengers in, so we flew through this stage in a matter of minutes. Paperwork, room key and important information were given and we were set to go! Before we started the process, we dropped off our main baggage, with pre-printed baggage tags, and they were shipped off to our designated room for the moment we arrived. The carry-on baggage, security and customs were just like any ordinary airport. It was quick, easy and from that point, we walked straight on the ship! Crazy right? We walked straight up the ramp, onto the ship and into our room. Lovely staff members are there to help us find our way and hey presto, our bags were already waiting in the room! 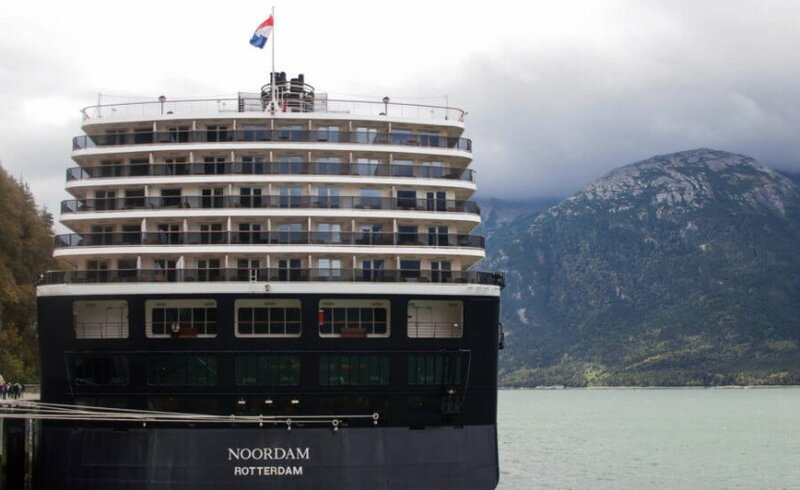 The Ms. Noordam ship is really big. Although, it was very organized, well signed and very easy to navigate. We had a verandah room on level 5 of the ship; starboard side and in the forward half. A great decision in my opinion, especially if you’re prone to motion sickness like me! After settling in and unpacking our bags (it’s so lovely to not live out of a suitcase for a week), there was an announcement for an emergency drill. All information was played through the speakers in the rooms, hallways and outer decks. No matter where you are on the ship, if there is an important message you will be sure to hear it! After the drill which took about 30 minutes, we finally started moving! A strange feeling for me, considering the biggest boat I’ve been on is a ferry haha. We were waved off by a huge group of onlookers and then we were out at sea! Much to my surprise, there are no options to use cash anywhere on board! On the outside of the stateroom doors, there is a little holder where important notices, bookings and daily guides are placed. Every day there is a booklet of things that are happening ashore and onboard the ship. The friendly staff won’t interrupt you in your room for anything that isn’t important – very considerate! In terms of in-room necessities, TV was great; 3 different channels of new movies, sports and news channels. Wifi is expensive – no free options, unfortunately, and 500 minutes cost $175… a little steep if you ask me. But it was certainly manageable! 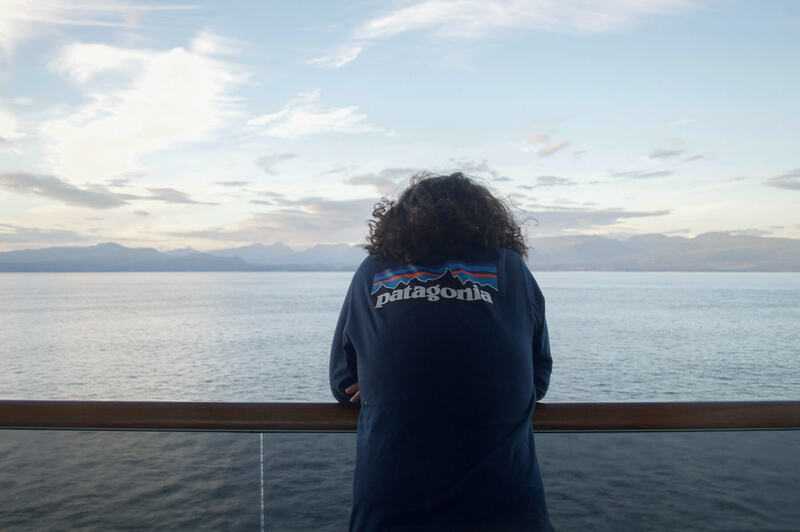 The 2nd day was the first full day at sea, and it was spent cruising the Inside Passage. This was a beautiful day of scenery, perfect weather and a lot of wildlife. 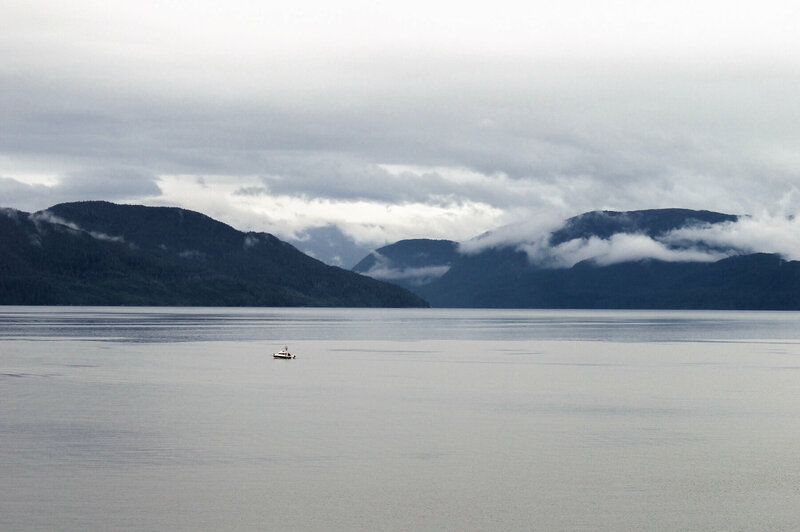 Both sides of the ship had land views, and it was a great start to seeing the sights of the Alaskan coast. Each night a form is placed in your room to fill out for breakfast. You decide what time you would like your food delivered and what it is that you would like to enjoy. The breakfast was always on time, and very high quality too. Everything from cereal, cooked eggs, meat, coffee, juice… All the way to pastries and yogurt. On board the ship there were also 5-6 different dining options to indulge in throughout the day. The most expensive being a French restaurant at $69 pp, and the cheapest being $15 pp for an Italian restaurant (delicious might I add). Most of the passengers (whom I will also add were at least 20 years older than I) spent the day participating in the onboard activities, exploring the shops and lounging by the pool. It was amazing weather, so I enjoyed the view and did a little exploring myself. Some onboard activities that were offered were detailed presentations of things to do the next day, lumberjack shows, public speakers, entertainment shows and more. The ship had a nightclub, presentation room, 2 pools, basketball courts, hot tubs, spa, hairdressers, masseuse, library and art gallery. What more could you ask for? This day at sea was spent exploring the massive ship, booking our onshore activities and watching the wildlife from our deck. You couldn’t possibly get bored with so many activities to get involved in. I quickly discovered my favourite thing to do and that was to simply look out the window. The world seems so different when you’re looking at it from the water. 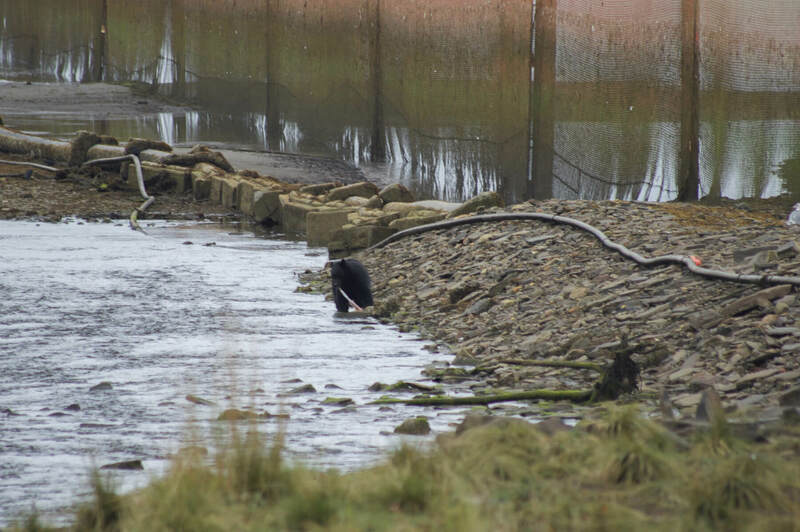 You see so many unseen animals, flora, and even the weather is so different to what it’s commonly like on land. When wildlife appears, the captain announces in all areas of the ship, telling the passengers where to look. Luckily almost all of the wildlife was on the starboard side, so we had the opportunity to see all of them when they appeared. We were extremely lucky to have seen a large pod of Humpback whales leap from the water right next to the ship. Such a beautiful start to the cruise! Such a beautiful start to the cruise! Day 3 was the first day at port. 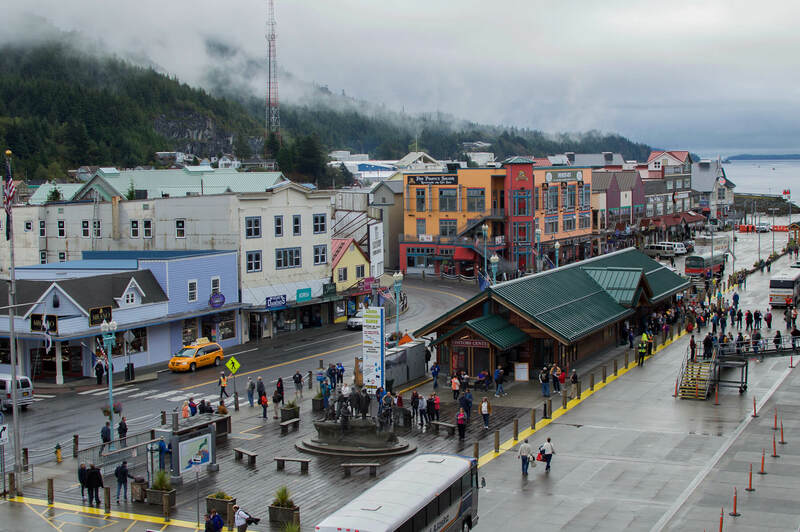 Our first journey ashore was in a small town Ketchikan, the shopping capital of Alaska. This quaint little town had a lot of onshore activities to offer. 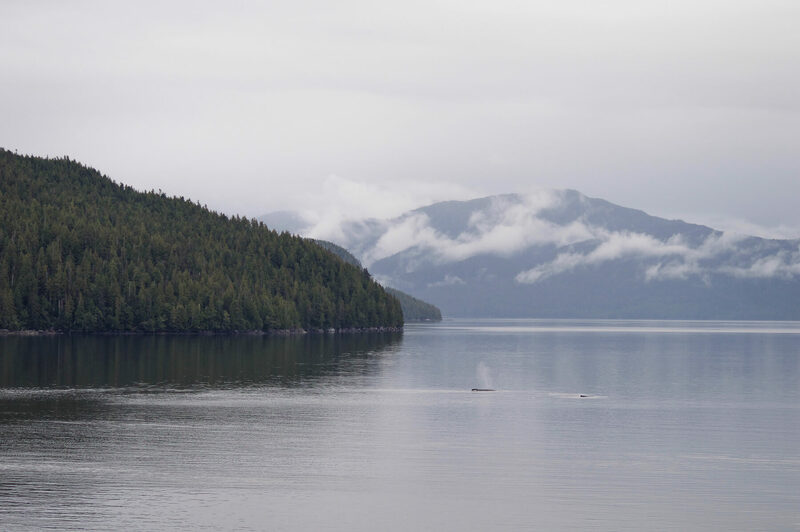 Everything from snorkelling, bear spotting, helicopter and float plane rides, lumberjack shows, fishing, sea kayaking and zip lining. 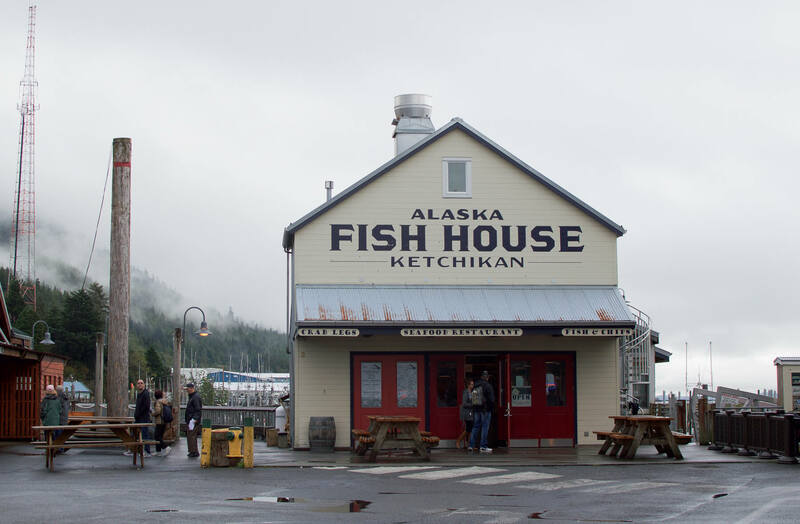 Each stop had hundreds of options and the one that we participated in Ketchikan was my personal fave. When you book a tour with the cruise, you will receive a ticket at the time of purchase (or they will be delivered to your room hatch). On the ticket, there’s the time of departure, where to meet the group and what essentials to bring. They really did make it easy! 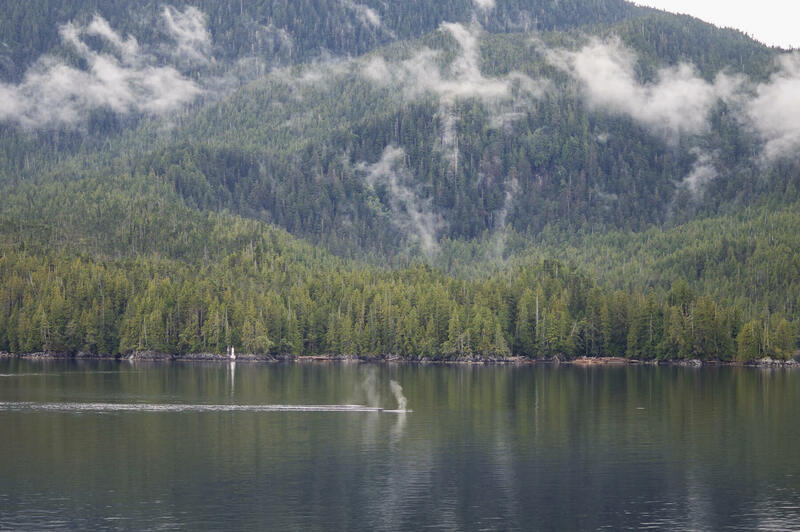 We opted for the Neets Bay Bear Watch by Float Plane at Ketchikan – a very expensive option ($379.95 USD) but boy it was worth it! A short 10-minute bus ride got us to the tiny airport on the bay. 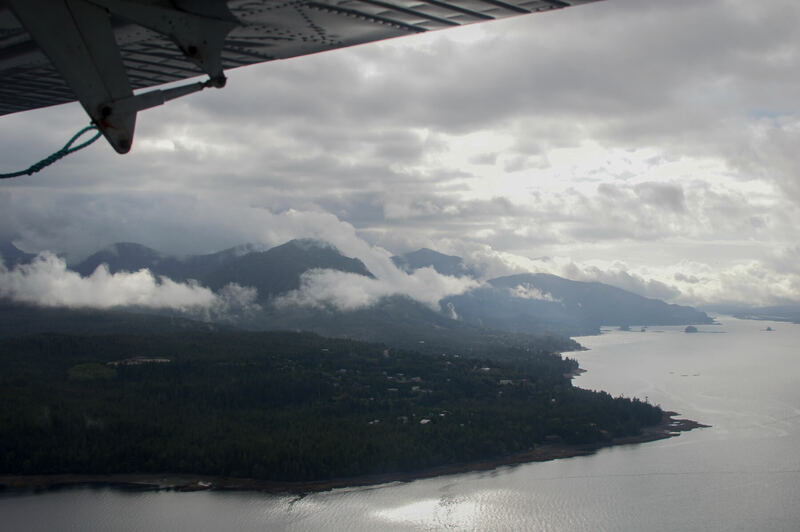 We boarded a small float plane and flew for 25 minutes over the most beautiful scenery imaginable. We landed in Neets Bay and were greeted by 2 Black Bears off in the distance. Our knowledgeable guide took us for a walk through Tongass National Forest and showed us claw marks in the Sitka Spruce, bear dens along the path and the grand finale was watching 2 black bears catch Salmon from the river. He taught us how to spot Bald Eagles which was incredibly useful for the rest of the trip, and gave us so much information about the difference in types of bear. Another beautiful flight back to the town, a delicious local lunch and we were back on board. The perfect amount of time to explore! Something I found quite interesting about the first day ashore, was just how simple it was to get on and off the ship. You scan your room key on the way out (which pops up your image that was taken at check-in) and you walk straight on out. There is only one way on and off for the thousands of guests, and the longest we waited was 5 minutes. Crazy, huh?! To get back on board you simply scan your room key, put your bags through a security scanner and that’s it. It’s really not all the difficult, how silly I was to think otherwise! 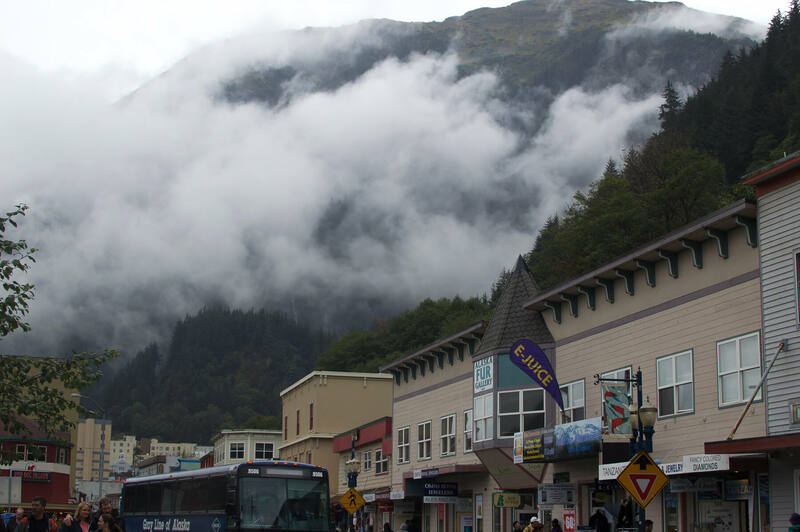 Day 4 we landed in Juneau, the capital city of South East Alaska (although very small compared to your typical capital). Today our stop on the port was much longer; 10 am – 10 pm. We left for our activity just after we arrived and a funny, knowledgeable and charismatic bus driver drove us 15 minutes to Douglas Island. On the way, he gave amazing information about the surrounding areas and landscapes. We suited up into our waterproof overalls, big gumboots and raincoats and headed straight for the water. It was time to sea kayak! 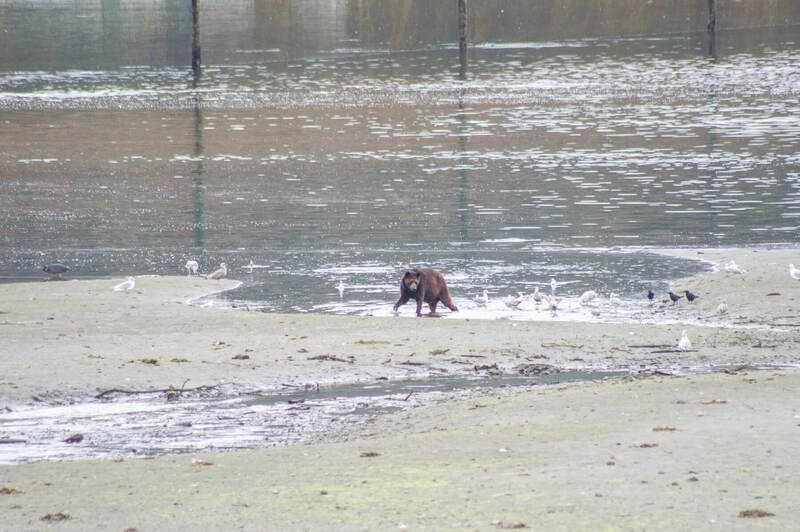 On the way down to the beach, there was a Sea Lion having great fun with a salmon; tossing it around and showing off his talent.. that’s Alaska for ya! 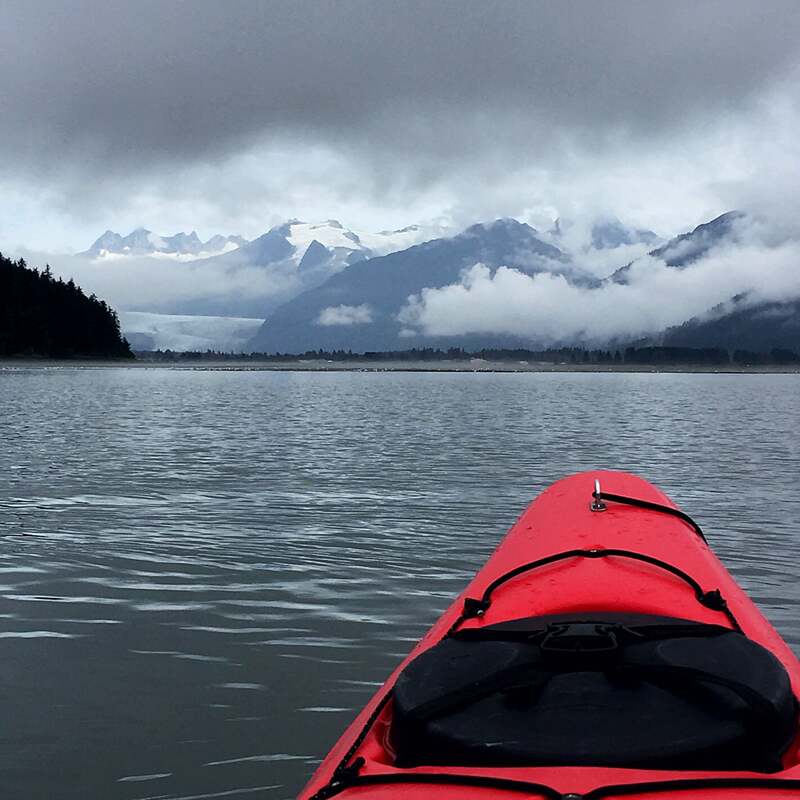 We spent 90 minutes in the water kayaking with 10+ Harbor Seals, Bald Eagles sitting on the buoys and looking at spectacular views of the Mendenhall Glacier and surrounding mountains. It was a beautiful activity, although I got absolutely drenched in the silty water… I had absolutely no complaints at all. Our lovely driver picked us up, we headed back to the ship for a warm shower and headed back out into the wilderness. 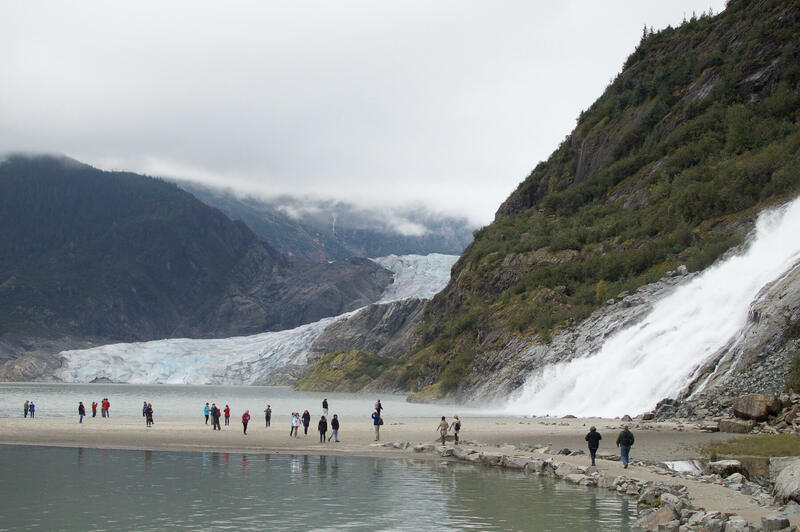 For the afternoon activity, we booked from an outer ship source – a return ticket on the local bus took us right up to Mendenhall Glacier and Nugget Falls. A beautiful walk around the chunks of ice, gushing waterfall and wildlife. It was absolutely freezing, but oh so beautiful! The walk there was amazing and the sights were just as great. Headed back to town to explore and eat the worst Mexican I’ve ever had (that’s why you don’t eat Mexican in Alaska I guess) and we were back on the ship for another relaxing evening! This tour cost $99.95 USD, another that was certainly worth every penny! 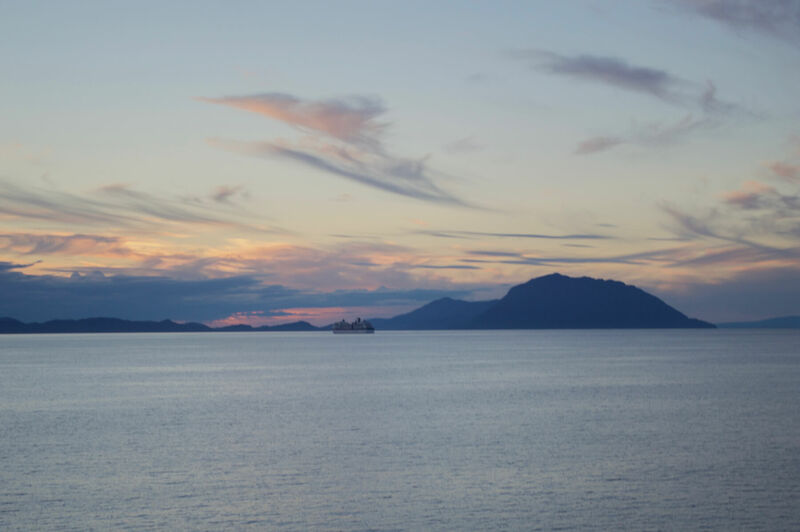 The last portion of my Alaska Cruise with Holland America Line is in the next post >>>>, be sure to check it out! Sounds amazing Kate, glad your having a great time, you won’t want to come home! Alaska and Canada is on my vision board to visit ? I am having the most amazing time, thank you Jenny! I’m so glad Alaska is on your list, it’s so beautiful.. I certainly don’t want to come home!